Why is Russell Crowe excited to turn 50? 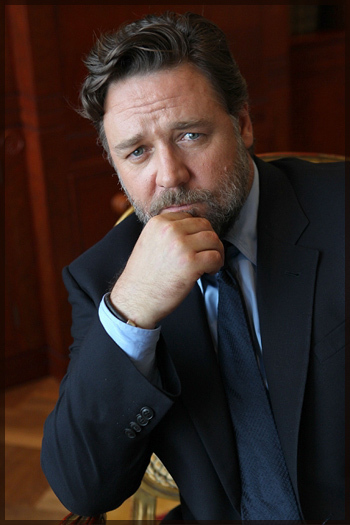 While most people fear turning 50, Russell Crowe just can’t wait! Speaking to the 2DayFM breakfast team about his birthday next week, check out just why the Noah star is excited for the big milestone above. Noah star Russell Crowe may have failed in his bid to meet the Pope, but the actor did get the chance to meet the Archbishop of Canterbury yesterday to discuss his bible to big screen epic. Crowe met with the leader of the Anglican Communion to discuss his role in Darren Aronofsky’s much talked about movie, which sees the actor take on the title role alongside all star support from Emma Watson, Douglas Booth and Jennifer Connelly. Crowe visited the Most Rev Justin Welby at Lambeth Palace, the Archbishop’s official residence, on Tuesday, the day after attending the film’s European premiere in London. Russell may have enjoyed a lengthy conversation with Welby and his staff but he wasn’t impressed by something he found in the Archbishop’s office – a picture of his Les Mis co-star Hugh Jackman. “Visited with the Archbishop ofCanterbury at Lambeth Palace, guess who the office girls pinup is @RealHughJackman ?”, the actor tweeted. While the Archbishop declined to give his thoughts on the film, a source close to him said that he found it “interesting and thought-provoking”, The Telegraph report. Russell’s visit with the Archbishop comes after the actor tried and failed to secure a private audience with the Pope, during his trip to Italy to promote the movie. Russell was hoping to screen the film for the Pope at Vatican City, advertising his plea during a relentless Twitter campaign in recent weeks. Vatican spokesman the Rev. Federico Lombardi has confirmed though that request from the film’s producers for a private audience was immediately turned down. Instead the actor was reduced to being one (famous) face among a crowd of 80,000 who turned out to hear Pope Francis’ general audience two weeks ago. As well as politely denying Crowe and the producers’ request for a private screening, Vatican rep Lombardi also informed them that the Pope would not watch the film as he cannot give any public endorsement. 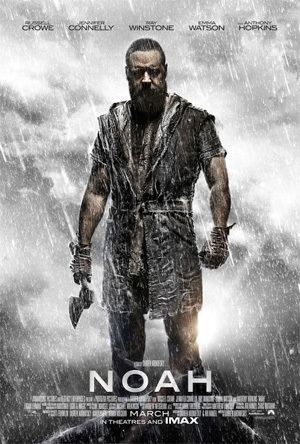 Aronofsky’s movie has come under criticism from religious groups for its retelling of the biblical tale, with Crowe declaring this week that it is not a “Sunday school story”. “When I started this process, I probably had a very limited understanding of Noah, which I believe is true of most people,” he said. “A lot of people think they know the story but what they recall is children’s stories from Sunday school and not what the Bible says. Hollywood star Russell Crowe broke down in tears this morning when he was told the news of the death of TV personality Charlotte Dawson. The 49-year-old Crowe and 47-year-old Dawson were friends from their teenage years – both growing up in New Zealand but moving to Australia to call the country home. The pair even lived near each other in the luxury apartment complex on Finger Wharf, Woolloomooloo. Crowe was not far away from Dawson’s apartment when police were called to the address on Saturday morning. A police spokesman confirmed a woman’s body had been found just after 11.15am, and that there were no suspicious circumstances. Crowe had been with his sons and friends at the Sienna Marina restaurant at the end of the wharf when he was told of Dawson’s death by a mutual friend, Woman’s Day journalist Jonathan Marshall. Crowe was visibly upset as he walked back to his own apartment in the Woolloomooloo wharf complex, and was pictured outside the restaurant with his boys – Charles and Tennyson – immediately after he was told the news. Shooting in near 50-degree weather hasn’t dampened Russell Crowe’s sense of humour. 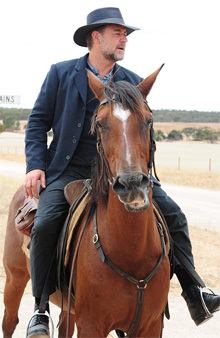 Crowe is in South Australia’s Flinders Ranges making his first film as director, The Water Diviner. On Thursday, showing off a scene he’d shot days earlier where his character is hit in the head with a log, Crowe quipped those experiencing the whack were in a position “many a journalist would feel privileged” to be in. As director and leading man, Crowe didn’t cut himself any slack, and made himself film the scene five times. The Gladiator Oscar winner plays an Australian father who travels to Turkey after WWI to find the bodies of his three sons lost in battle. He believes, in a way, that the story picks up where the Australian classic Gallipoli left off – showing the aftermath of war. “This is what happens to the people who were left back at home. There’s a whole bunch of stuff to do with being a father, grief and loss. The past week has been one of the biggest on The Water Diviner production, largely spent shooting a scene where a train carrying fighters is ambushed, replete with gunshots, explosions and men on horseback. The outskirts of the town of Quorn is standing in for Turkey, with the tracks and carriages supplied by the local Pichi Richi heritage railway. Crowe hand-picked his crew and co-stars, including young Australians Ryan Corr (who plays one of his sons) and Jai Courtney, old friends Jacqueline McKenzie and Steve Bastoni, Ukrainian-born beauty Olga Kurylenko and Turkish actors Yilmaz Erdogan and Cem Yilmaz. The acclaimed actor’s transition to director shouldn’t come as a surprise. Producer Troy Lum marvelled at Crowe’s ability to flick between actor and director mode in same scene, while co-producer Andrew Mason declared the first timer was doing “bloody well”. The director’s responsibilities have so far included everything from approving characters’ costumes to negotiating with representatives of the Turkish government to receive permission to film in the country. The production will move to southern Turkey in March. Crowe laughed that “if I can rely 1000 per cent on the central character, it does make a lot of other things easier”. The Water Diviner has already been sold to many international territories on the back of the story and Crowe’s appeal. A release date is yet to be set, but it looks likely to reach cinemas in early 2015. Russell Crowe has walked the world’s red carpets as one of our top actors but he looked like an ordinary bloke on a horse when he stopped by the sleepy South Australian town of Eudunda yesterday. The Oscar winner brought a touch of Hollywood to the town, population 600, as he shot his directorial debut film The Water Diviner, a drama about an Australian man who travels to Turkey after the Gallipoli campaign to find his missing sons. Crowe, dressed in black suit and hat, endured hot conditions as he rode a horse up and down a dusty track at Australia Plains, about 100km from Adelaide. Fellow Australian actor Damian de Montemas was also on set, dressed in Outback attire – beige pants, brown boots, white shirt and Akubra. The cast and crew have been giving the region’s pubs, cafes and restaurants a solid workout and locals have been Crowe-spotting, with sightings of him in nearby Burra, cycling from the town to the sets at World’s End about 25km away. Other South Australian locations for Crowe’s directorial debut are believed to include Port Augusta, Quorn and Adelaide. The cast and crew will then move on to Turkey to shoot the Gallipoli side of the movie.